The urge to purge is real and it’s snaking its way from my wardrobe to my beauty stash. I tore through my products like the Tasmanian Devil! This week I set aside time to pare down my (admittedly massive) nail polish collection and am super happy with the results. I thought I’d share the before, my process, and the after with you here. I’ll be the first to admit that I had a polish problem in my late twenties. I got a wee bit carried away, to say the least, and amassed quite the collection! Three years ago I had four 100-bottle wall racks almost completely filled up. I certainly didn’t need that much polish, nor did I really even want to have that much. I just had gotten into a bad impulsive habit of buying more and more of it. It was around that time that I decided to start cutting back and slowly pare down my massive collection. This didn’t happen overnight. It wasn’t really until I hit age 30 in 2013 that I started feeling a natural inclination towards having less in general and became more aware of my tendency to collect more things that I really wanted. Please be advised that the following text contains a referral link. I receive store credit if you purchase something using the link. 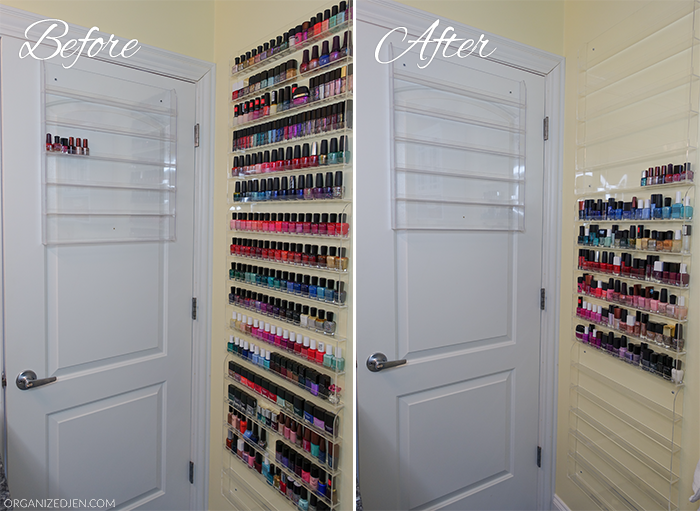 Fast forward to just this week: the “before” shot shows my nail polish stash taking up just less than three racks. My polish racks are hung in my home office bathroom where there is light and climate control since no one ever uses the shower (aside from my dog Winnie’s bath once every few weeks) and there are no windows in there. It’s the perfect place to store polish, but perhaps too perfect because I accumulated way too much! I slowly cut down my collection over the past couple of years while still accumulating some mainly through my monthly Julep Maven subscription. Although I cut way back on buying polish outside of the subscription, it still felt like an overwhelming amount to me. My initial goal going into this purge was to cut it down to fit on just two racks at the very most. As you can see, I did more than that and managed to get it down to just one. I plan on removing the three empty racks and sticking to a one-rack rule. 100 bottles of nail polish is more than enough for me! This was a relatively simple task; it just required some time. 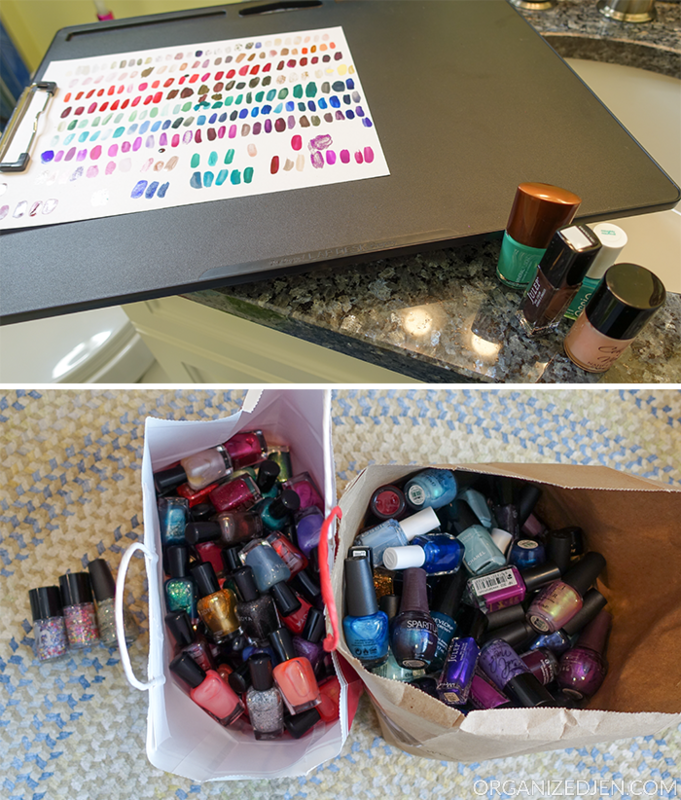 I prepped by laying out a white towel (to better see the polish colors on), grabbed a few shopping bags to sort outgoing polishes into, and clipped a plain sheet of white paper to a board for polish swatches. Then, I took all of the polishes down off the racks and sorted them by color on the towel. This allowed me to really see what I had in each color category. I pulled bottles I knew I didn’t even need to swatch for the “to go” pile while I was laying them out. Once I had all of the “maybe’s” on the towel, I started swatching. Doing this in order of color helped me to see what dupes I had and get rid of more. 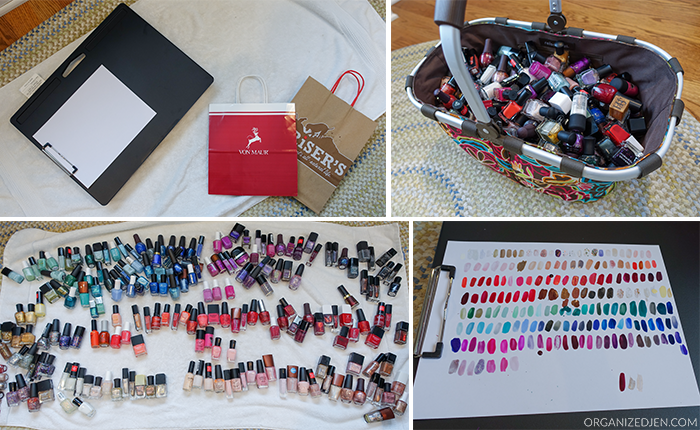 Once I finished this process and was left with the polishes I most wanted to keep, I piled them back into the basket and took some time to sort the bottles back on the racks. I decided to put them in order of color as opposed to brand like I had organized them previously, because I can better see what I have in each color category and know when I have dupes or very similar shades. It’s also easier to find a color this way when I want to paint my nails. I noticed I was pretty close to having all of the polishes contained to one rack and decided I wanted to go for it, so I brought my swatch sheet into the bathroom to try to weed out the remaining dozen or so I need to make them all fit. I re-swatched lookalikes until I got it down to one rack only. I also have a few mini polish bottles that I use for travel, which don’t fit on the one rack, so I decided it would be ok to store those with my travel toiletries instead. I was happy that only three of the several hundred polishes were dried up and needed to be disposed of. I’ve searched for places to donate used polish, but have come up short in my efforts, unfortunately. I’d rather re-home my castoffs than toss them (keep in mind you have to take nail polish to a hazardous waste facility for proper disposal) as there’s a lot of good quality polish to share. I’ll let my family and friends sort through and see if they’d like to keep any and then see if any of their friends would like some, too. Hopefully all all of the polish will find new homes and bring others joy. If you know of any places that accept used nail polish donations, please let me know! I realize having 100 bottles of nail polish might seem like a crazy amount to some, but it feels just right to me in this moment. I now have a nice selection that are all favorites on hand to choose from. I’m extremely happy with how this purge turned out. It sounds a bit silly, I know, but I actually feel lighter knowing I’ve cut down my polish collection to a size that feels right for me. I’m going to experiment with a “one in, one out” policy and see how that works going forward. I will be sharing an in-depth video next on the rest of my beauty purge efforts, including all of my skincare, hair care, bath & body products, and cosmetics. Stay tuned if you’re interested! I’d love to know if you’ve been inspired to purge your own beauty stash lately. Please share if you like! Congrats on a job well done – as long as you are happy that is all that matters. I totally understand the love for nail polish. I am one who loves to change up my nails and toes often. i love Essie nail polishes & have a nice collection. a few Revlon(s). I wish there were more greens, apparently folks do not like green. i have lots of pinks, purples, blues, reds, …changed them up with my moods. I recently purged my clothes and got rid of 4 very large trash bags. I can’t wait to go through my beauty supplies to clean up my bathroom space! I also have to ask where you got that fantastic large clipboard! It’s actually a lap desk. I believe it was from Bed Bath & Beyond originally. If you can’t find anything like that, do you have a favorite nail salon? The place I get my pedicures has racks like yours. I wonder if they would be allowed to accept a donation. It’s better than trying to dispose of them properly!! I did the same thing last year and it feels so good having space! I think for me realizing i couldn’t possibly use every single color was what helped me! So i gave them out to family and friends and what was left went to charity. Also i have to thank you for introducing me to tone it up, your vlogs and blogs help so many, please remember that! Try donating to a women’s shelter or senior citizens center or home. I work at a retirement community and we are always doing manicures on our ladies. Some varied polishes would be appreciated. Hey Jen! I have a new ministry for girls 2nd-6th grade. We are studying true beauty and they love all things nail polish! If you cannot find a charity, I know some really sweet little girls in Eastern Kentucky who would be tickled. Please email me at organizedjen@gmail.com and we’ll chat! Still trying to figure out if USPS will let me ship polish. Wow….that was some purge! I just l went through my makeup and skin care and managed to toss quite a bit! I feel so much light myself! Thanks for sharing…I am loving your purge topic…it gets me really inspired!! Did you check with domestic violence or homeless women’s shelters? They will often take beauty products. I remember watching your videos when you were setting it up in that bathroom. I’m loving seeing how you are going through things and it is definitely giving me motivation to try to do some of it here in my home! After the death of my mom 2 years ago and moving my dad to be up close to my brother and I, we have accumulated many items in our house. I didn’t know how I could deal with all the guilt of getting rid of anything. You have helped to explain things that maybe I can actually start. Thanks for sharing the process with all of us! Just did a purge of Julep and eliminated 60 plus, Formula x and Ciate. The theme I noticed is that most of the ones I love are cool tone, most of the ones I am passing on are warm toned colors. This is born out by my color choices with Zoya, since they designate the tone in their subscription. Since using this descriptor I have been much more successful getting colors I love and that play well with my skin. Especially with online ordering, I have been disappointed when I get a color that does not work with my skin tone, then it gets worn once and that it. Waste of money. I did mine by brand, I like your method of color better, great way to see the overall colors and potential duplicates. I store mine by season. Nail polish is a hard thing to keep track of what you have and easy to impulse buy for sure! My mom is in a Nursing Home and they have volunteers paint the ladies nails. Maybe you could try Nursing Homes. I’d ask to speak to an activities coordinator. Or a womens/children shelter. I’m sure the little girls would love to have their nails painted. Hi, Jen. I have been a subscriber for a looong time now, and I don’t think I’ve ever commented. 🙂 I did the nail polish purge 2 weeks ago. I had 144 nail polishes. I started collecting since 2009. I have 50 left now (only the ones I really like and will buy over and over again), and the other ones were colors I did not like anymore. I put them in a bag; my sister and my sister-in-law picked and choose almost all of them. However, little did I know that you were going to do the clothing purge and that’s what I did next. I am going to turn 27 in exactly one month and I feel like my style has changed and is changing and I had gotten tired of the same clothing items. Thank you for inspiring me. I am intending to do the same with my makeup, even though I only have 3 face brushes and 5 eye shadow brushes and probably like 10 eye shadows in total, but still… I feel like I need to “unload” 🙂 Thank you. Jen why not contact your local women’s refuge to see if they would like them? Sometimes women have to leave with just the clothes they stand up in and I know they ask for personal care items, but not sure exactly what they accept. It might be worth asking though. I’ve called a few places and they’re very picky about only accepting brand new cosmetics, including nail polish, but still hoping I’ll find one that accepts used. I’ve got to admit, the full wall of polishes just looks pretty to begin with but you’ve done an amazing job and whittling it down to so few! I probably don’t own half of what you own and I KNOW a lot of what I have needs to be thrown out, I just have to sit down and actually go though them and do what you’ve done! Maybe a weekend project? I’m trying to purge my skincare at the minute, I’ve amassed so many products and samples. I’m trying to just work my way through everything I have before I buy anything new but it’s so hard and time consuming! Wow that’s some major purging! Good job! They visit hospitals and help create a positive atmosphere by having nail polish parties. I tried emailing them and it was returned as if the email was shut down. I wonder if they’re not running anymore? I wonder if a women’s shelter type of place would take them? They’re hard to locate for safety reasons but they’re all over. Not to be weird, but I wonder about a women’s prison or halfway house? I think the colors you chose to keep are just gorgeous! They look so pretty all color coordinated like that. Jen, most women’s shelters will accept used makeup/nailpolishes so try a local shelter. I have a large collection too and find myself buying pretty colors. You have just given me the incentive to clean out my stash. I love the way you have sorted it into colors and not brands. Jen I love your videos and your blog in from the UK And have been thinking of writing to you for they last year but never got around to it. I would love to take leftovers off your hands. I’m happy to pay postage to the UK. I’m i sensed with pokish also this weekend your going to be my inspiration to get rid of my clothes using the mary kondo method you really got me inspired!! Sadly we’re not allowed to ship nail polish via airmail from the US, only ground shipping is allowed. I just checked out this list of charities in the Chicago area, https://www.chaostoorder.com/resources/donations/. 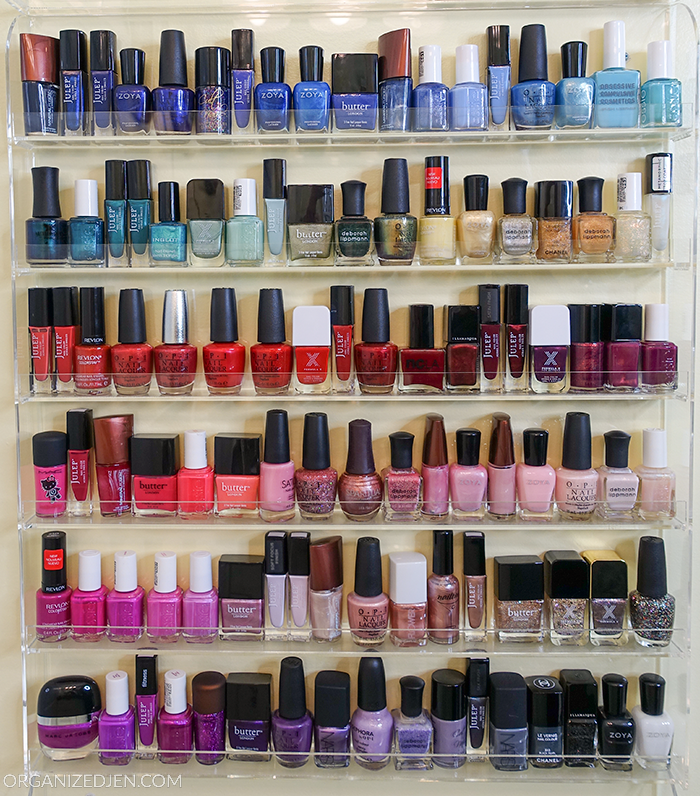 If I were you, I would call Women’s Club of Evanston – Dreams Delivered and hear, if they were interested in a lot of nail polish, they could match up to the prom dresses they are donating. What girl wouldn’t want a matching nails to there dress? Can’t wait to see more from this series. Are you going through your kitchen and household equipment too? I hope you find a place, where the polish makes other girls/women happy! Looking forward to hearing which solution you find. The Women’s Club of Evanston – Dreams Delivered are hosting their annual shop/store event this Monday through Wednesday (April 20th-22th 2015), so if you are fast, you can donate this year. They off course have finished their pick-up round, but it shouldn’t be that long a drive from you to the Clubhouse on 1702 Chicago Ave, Evanston. Can’t wait to hear, what you find out. Thanks for the idea! I have reached out to Dreams Delivered and we’ll see what they say. Love this post! I also have a ton of polishes that I want to let go, but I don’t want to toss them in the trash. I missed hazardous waste pickup this season so I’ll have to hang on to them until the next one. For me, that reason along with feeling much happier with less stuff makes me think and re-think if I want to buy a new polish. Maybe try a nursing home. My daughter volunteered in high school and painted the residents fingernails. They loved it! 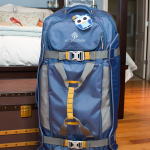 Hi Jen: I only started following your blog last year re the organizers which was awesome ! I love how much detail you provide and how truly interested you are in all the products as I love stationery too. I hope you will be doing more stationery posts – i’m really interested in European stationery and gorgeous unique items for writing. I also loved your attendance at the blog conference – fascinating as we don’t have that where I am. I think I’ve become a bit surprised at how many of the posts are about material possessions. You’re so highly talented, I wondered: what kind of person has the time to spend hours sorting through 400 nail polish bottles to the point they even swatch them on a piece of paper, then resort into color order ? Not in a bad way – again, because you’re so talented – just wondering. I think Caoimha mentioned it in her post: anxiety. When I saw your racks of polish I could only see a strong hoarder / anxiety thing. And I wonder if it makes people anxious to see posts filled with material possessions ? I know I’ve done it once or twice, where I feel the need to buy shoes in two colours or the same top in three colours. Then I barely wear them ! I know the fru-fru gurus might say it’s to fill a void or that we believe we’re not enough without material possessions: I think it’s just born of being in the western world at a time where consumerism rules. In fact, I once worked with a lady who bought seven new handbags in one hour: it’s like we don’t know when to stop. So then I got thinking about want versus need. Maybe that happens as we get older, as you mentioned ? We become overwhelmed and realize we don’t need that much. Or, after we’ve gone backpacking for six months and realize we can actually survive with the smallest amount of stuff. I am delighted to see you purging and wonder if you might ever be interested in doing some ZenJen posts on minimalism ? The world is so full of imbalance – people with absolutely nothing versus those of us who have so much (and barely use it or remember we have it). I’d love to read about how you’re doing with less or using less. I noticed in your Empties post for example, how many products you go through: are these all to promote products ? * I have a great idea for the partially-used nail polishes as I know most places cannot accept due to hygiene and safety reasons: craft !! Setting you a challenge Jen. Can you show us some fabulous crafting work we can do with unwanted nail polish ? Maybe on glass, or wood, or something surprising. Perhaps for kids to make in the school holidays ? Oh and PS: in case you’re wondering … I own four nail polishes and only use them on my toes in summer. Love Zoya. I actually wish all make-up and skincare companies would simply make mini-versions (like a 1/4 of the size) of everything so as we get bored we’re wasting less. Hi Jen I have watched your videos and remembered seeing your nail polish collection and I used to wonder if it was a habit of buying because most of the time especially lately I would look to see what color you had on and you would have none lol . So I guess its good you purge since you dont seem to use them all the time . I notice how you are changing in your taste for clothes as you’re getting older its beautiful to see the changes of a young woman . I wish you the best you do inspire me and I’m sure many . That must have felt great to take on that task. Your collection looks great and I consider it a hobby. Love your posts and your videos. 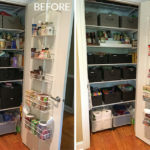 Great organization!like how you ranged your bottles, lovely shades too! I recently purged my color cosmetics and ended up getting rid of over 150 too old lip and face products. I would probably not purge my entire nail polish collection; even though I have around 500 or so, they are all swatched and organized in an IKEA Helmer that fits perfectly under my vanity. I’ve simply stopped purchasing any, although I do get some in subscription bags, I share them with other nail polish lovers. In the past, I have contacted a women’s shelter and they LOVE getting nail polish. They are willing to accept used and open nail polish, and are so excited whenever I bring skincare or color cosmetics over there as well. Hope that helps someone! Thank you for sharing your purges. Especially the videos. I too had purged my polishes, but could probably whittle it down even more. I am also trying not to purchase any new ones, unless it it something totally different than what I already have. De clutter videos give me the nudge I need! I could not do it,! Loved your polish purge post! I have two full racks and for every new polish that comes in… one has to go. I have two polish subscriptions, which I love – so this is a monthly process. I hope you can find a good home for your old polishes. I am holding on to some for craft-y stuff. Pinterest has a lot of ideas: Christmas ornaments, Easter eggs, Mugs, and more. Do you mean my eyeshadows? They’re from Sigma’s Warm Neutrals palette. My polish collection is only rivaled by my yarn collection – I think it satisfies my desire for color and textures! My Julep subscription has helped me see though that there are always new colors coming along, and I can treat myself to new shades without feeling like I have to hold on to them all. A new polish is less than a manicure, so I figure it is okay to use once and then let it go. That being said, I donate the ones I am done with (usually only used once or twice) to my local women’s shelter. They have a manicure night and the women love to have new polishes (the shelter doesn’t have a budget to provide much of a selection), and the daughters love that quality time of pampering with their moms! 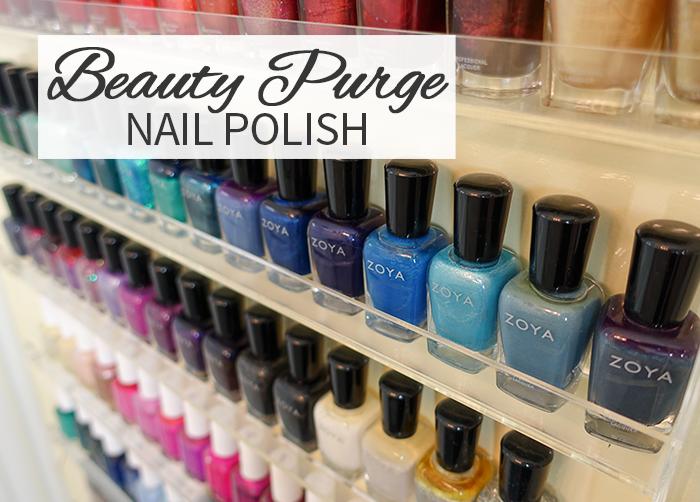 What a great way to donate your polishes! What about places where nail polish may be used for crafts? There are lots of creative ways to incorporate it into artwork, handmade jewellery with painted glass pieces, that sort of thing. The restrictions might be less strict and I’m sure the colour range would be much appreciated. Zoya is the BEST nail polish I have ever tried! Their nail polish remover is incredible as well – less chemicals! It’s my go-to remover as well. If you have more used nail polish to give to charities, we would love to get them. Every year, we hold a Christmas party at a public hospital in Manila, Philippines for the cancer-stricken children. We hold a nail polish booth where they can have their nails done and decorated. Goal is to make these children feel beautiful inside and out. I am based in San Jose, CA. What a wonderful tradition! I don’t have any polish left to donate at this time, but I’ll keep you in mind if I do another big purge someday! After years of collecting nail polish my 500 bottles just felt so overwhelming and most of them sat unused for 5 years so I recently got rid of a ton but had the same problem unless u give them to friends it’s hard to find places that take them as donations. Rack looks great. I recently googled to find somewhere to donate my polish to. I found this in my search. Great cause, great idea. Please consider.